On Sunday morning the Stanford Cardinal held their first public scrimmage of the fall and Bleeding Cardinal was there to catch all the action. 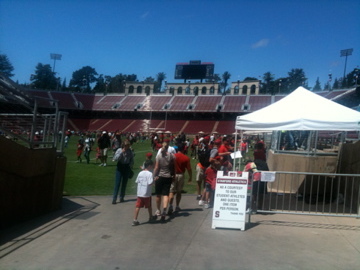 The cloudy sky greeted the team and about a thousand onlookers at the Stanford Rugby field. The Cardinal began the day working through a variety of drills. Noteworthy during this session was the inclusion of wide receiver Jamal-Rashad Patterson in some of the first team work and redshirt freshman quarterback Brett Nottingham connecting on some impressive throws to true freshman receiver Ty Montgomery. At approximately 10:30, the scrimmage began. The first drive consisted of the first-team offense going against the first-team defense. During the drive, Andrew Luck completed passes to Chris Owusu, Griff Whalen, Stepfan Taylor, Zach Ertz, and Ryan Hewitt. Luck completed the drive with a touchdown pass to Hewitt. In the competition to replace Owen Marecic at fullback, it would appear that Ryan Hewitt has taken the edge as he received the most first team work. A punting session followed. Both David Green and Daniel Zychlinski were impressive. There was no clear separation between the two in the competition. The next drive began with Brett Nottingham and the second-team offense going against the first-team defense. Nottingham moved well out of the pocket and had an impressive zip on the ball. He completed three passes to running back Ricky Seale, including a twenty yard gain. There were two penalties called one the drive. Jamal-Rashad Patterson was called for illegal touching for running out of bounds and coming back in to attempt a diving catch along the sideline. Defensive end Ben Gardener was also called for offsides. The drive ended without a score as Delano Howell broke up an attempt. The Cardinal began a new drive from the twenty yard line with Nottingham still under center. This drive also ended without a score as Nottingham barely missed Patterson on a deep ball and threw an incompletion to Ty Montgomery on fourth down. Punting drills followed. Drew Terrell and Ty Montgomery worked as punt returners. The next drive put Robbie Picazo at quarterback and true freshman Remound Wright at running back. The offense scored in only three plays as Picazo connected with Corey Gatewood on a deep out that he turned into a touchdown by out running the defense. The Cardinal began a new drive with Picazo, but did not enjoy the same success. Remound Wright and Michael Spanos were stuffed in the run game and Picazo was only able to connect on short gains with true freshman receiver Devon Cajuste and Spanos. Kickoff drills followed with Eric Whitaker and Jordan Williamson taking turns. Luck brought the first-team offense out to face the second-team defense. During the drive, Luck connected with Ertz, Patterson, Fleener, and Gatewood. The most impressive play of the drive was a fifteen yard gain on a reverse by Ty Montgomery. The offense failed to score a touchdown. Next came Nottingham’s turn again. Going against the first team defense, the offense struggled to move the ball and received their biggest chunk of yardage from a defensive pass interference call. Picazo returned to lead the next drive. His passing was sporadic and sailed some throws high while others fell short. The offense failed to score. The next drive provided the first look at true freshman quarterback Kevin Hogan. Hogan worked with Wright and Kelsey Young in the backfield. The running game worked much better against the back up defense as both backs ripped off big gains. Despite getting to the gaol line, the offense failed to score. Fellow true freshman Evan Crower replaced Hogan for the next drive. Crower completed a pass to Rollins Stallworth before the running game took over. Wright had a big gain of twenty yards before Young matched him and dashed into the end zone. The Cardinal completed the practice with Williamson and Whitaker going back and forth on field goal attempts. Williamson appeared to have the stronger leg. -Josh Nunes did not participate due to an apparent foot injury. -Patrick Skov worked with the back up defense at inside linebacker. -Sam Schwartzstein was called for a false start as he continued his battle with Kahlil Wilkes for the starting center job. -For final stats, Luck was 12-16 for 115 yards. Nottingham completed 6-8 for 49 yards. Picazo was 3-8 for 71 yards. 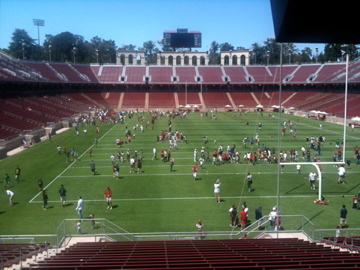 GoStanford gives a rundown of the scrimmage. The Mercury News describes action from the practice. 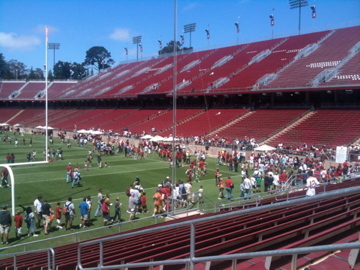 Following the scrimmage Stanford hosted an open house inside Stanford Stadium. 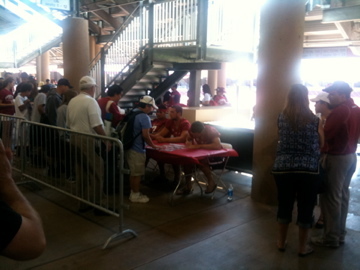 Fans could attend for free and get autographs from players. Children participated in skills competitions on the field. 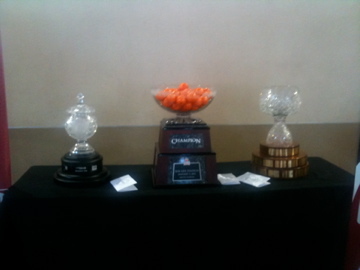 Also, the Orange Bowl trophy was on display in the concourse. Overall, the day seemed to an incredible success. 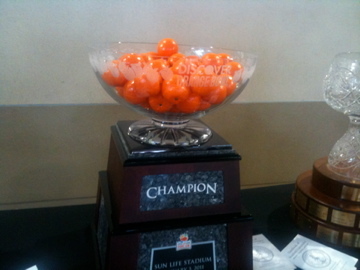 There is kind of an enthusiasm for the upcoming season that, in the past, had been sadly absent from Stanford football. Hopefully this bodes well for strong support all season, starting on September 3rd against San Jose State.